My progress on my La Passacaglia continues slowly. In the meantime, I finished some Christmas projects (in March!) and generally enjoyed a break from most sewing. As you can see, my blue-and-orange color scheme also incorporates some reds and yellows. Early on, I made a coloring template for my Passacaglia in MS Word. I didn’t share it because I was concerned about copyright laws and didn’t want to steal the work of a designer. 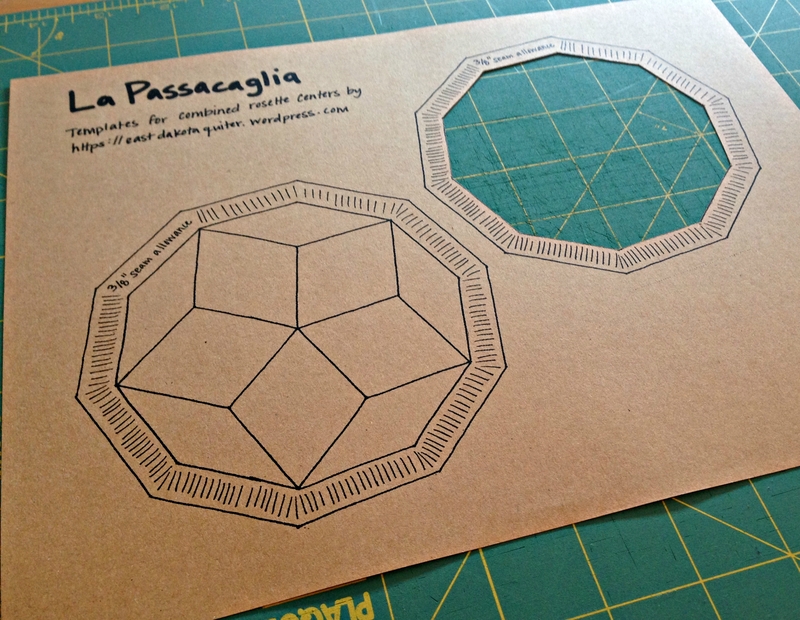 That said, the Passacaglia is everywhere, and others have made their coloring sheets publicly available. Theirs are also better than mine because all the shapes actually line up, haha. 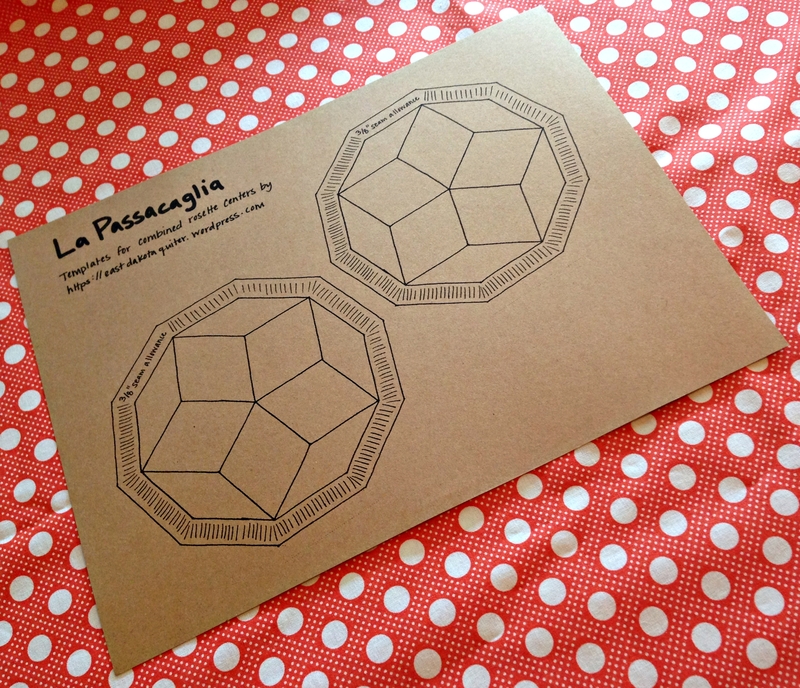 If you’re interested in a free La Passacaglia coloring sheet, I used the one I found here. 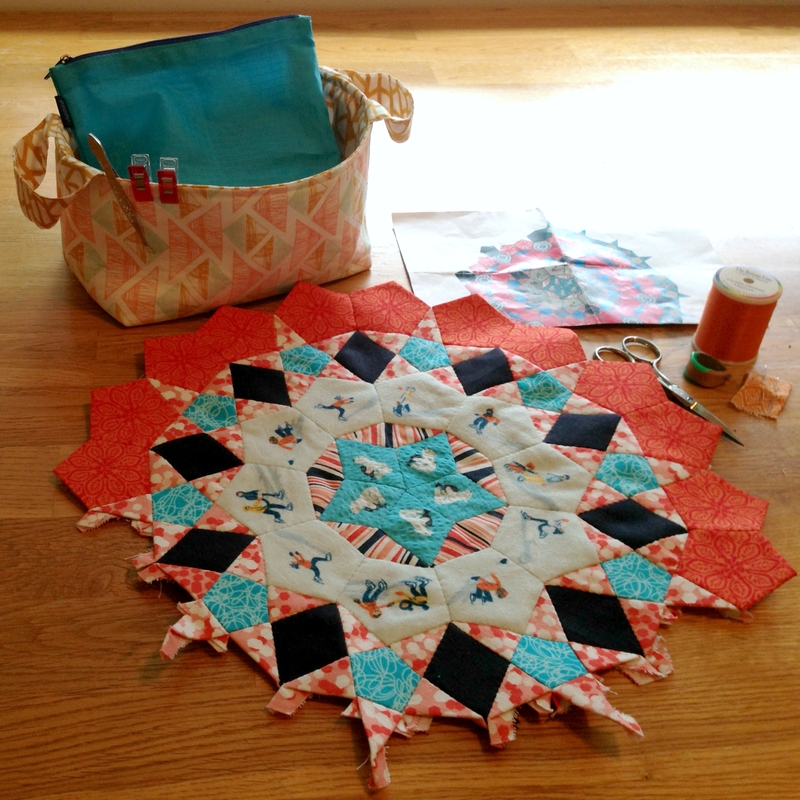 Categories: Quilts | Tags: blue and orange passacaglia, coloring sheet, english paper piecing, epp, free la passacaglia coloring sheet, free la passacaglia template, free passacaglia coloring sheet, hand sewing, la passacaglia, la passacaglia progress, la passacaglia quilt, la passacaglia template, lapass, millefiori quilts, paper piecing, passacaglia coloring sheet, passacaglia progress, passacaglia rosette, passacaglia template, progress, quilt, quilting, rosette, slow sewing | Permalink. 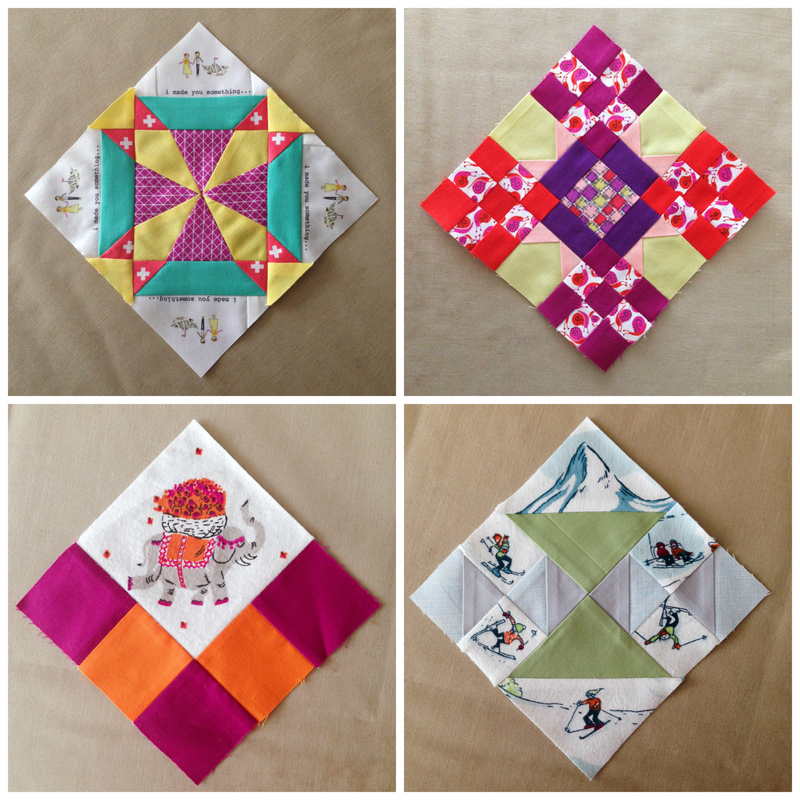 If I make blocks in a different order from the officially organized quilt-a-long (QAL) and even change some of the blocks, am I still a QAL participant? I’ve decided the answer to that question is yes! And today I’m here to share the blocks I’ve completed so far. 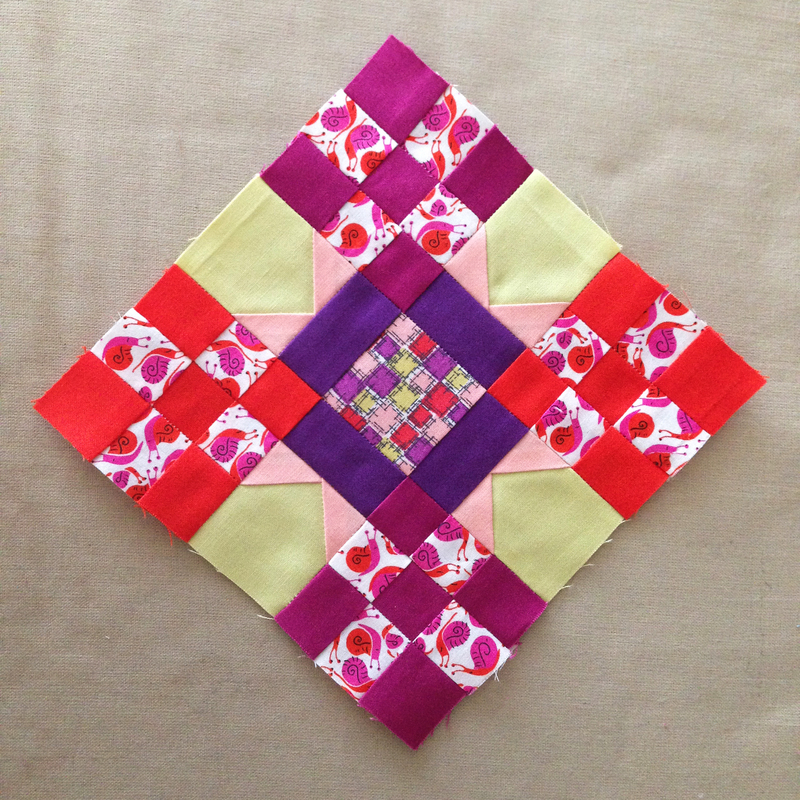 This QAL is graciously being hosted by Kerry, whose blog is VeryKerryBerry. Check it out or follow her Instagram hashtag (#FW1930sQAL) for more inspiration. 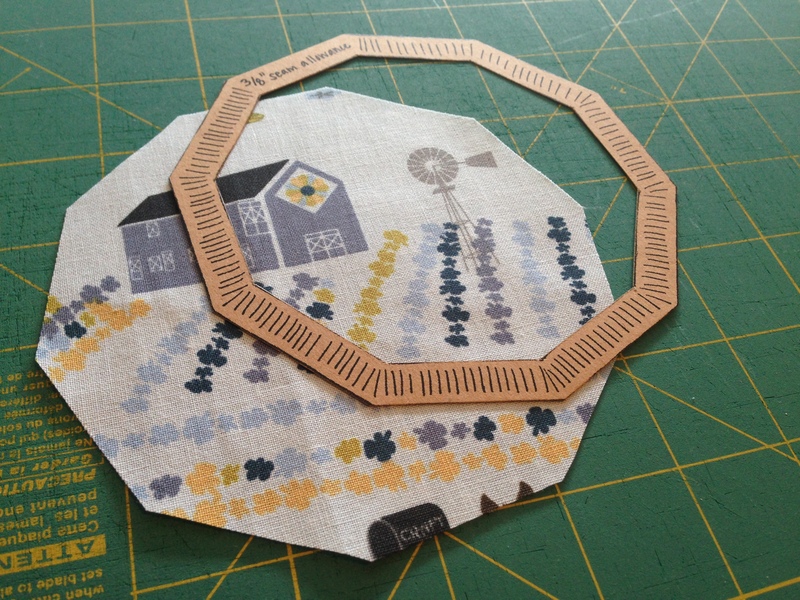 For those who aren’t aware, block patterns come from the book The Farmer’s Wife 1930s Sampler Quilt. Each block is paired with a letter that was written by a farmer’s wife and submitted to the magazine The Farmer’s Wife in the 1930s during the Great Depression. The letters provide a snapshot of life in that decade, but the letters selected for publication also tend to be uplifting, which is remarkable considering the challenges faced by farmers at the time. The letter paired with my block was one of my favorites. You’ll have to buy the book to read the whole thing, but the gist was that by having a radio, the writer felt she sometimes knew more about what was happening elsewhere in the world than she did about her own community and neighbors. It’s crazy to think people already noticed the effects of globalization in a very real way back in the 1930s! I also love that the block shares a name with my Great Aunt Carol, someone who sewed lots of things for me through the years. 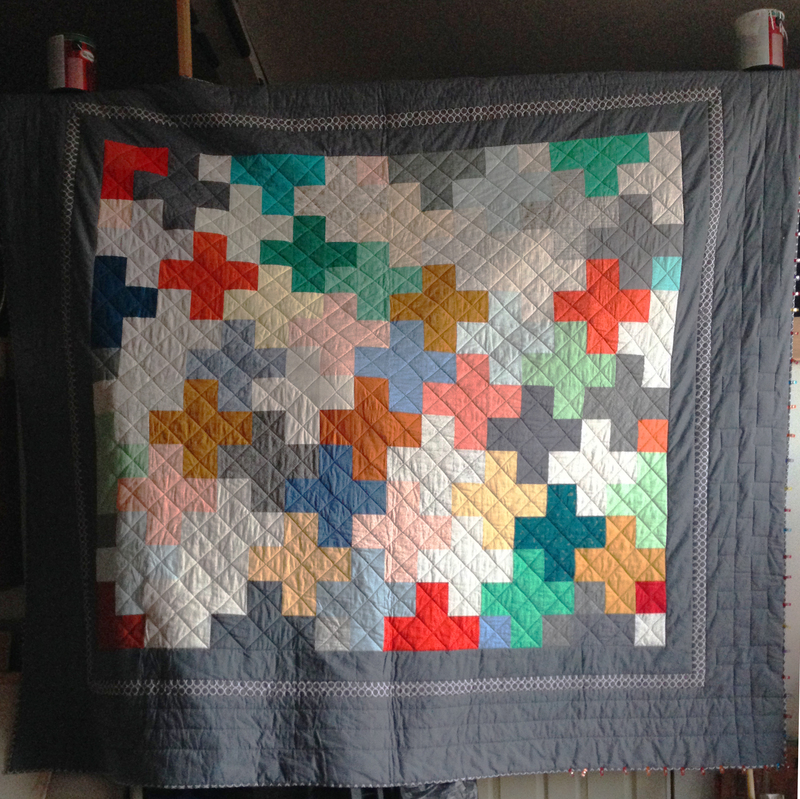 If you’ve been on my blog awhile, you might have read about what I call my Ugly Quilt. I used lots of gorgeous fabrics for what was to be my first-ever quilt, but they clashed fiercely… and so the pieces ultimately went to a thrift shop, where I wouldn’t have to repurpose my failure into a new project, haha. For those who are already HR superfans, you might be thinking to yourself, What the heck?! 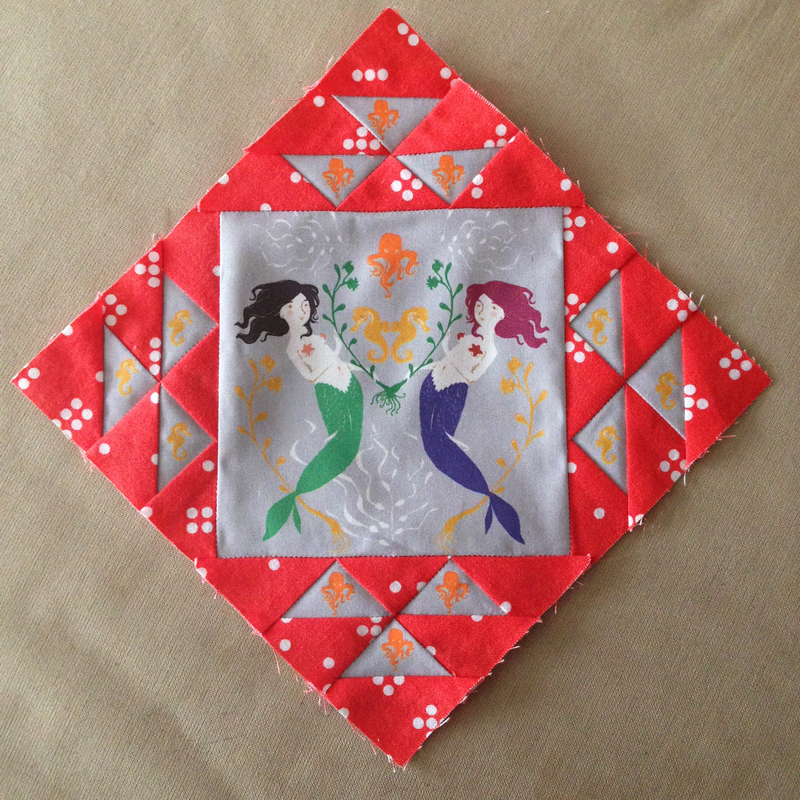 The mermaids in that Carol block are NOT in one of Heather’s original colorways. Did Tiffany STEAL Heather’s artwork? To that, I answer: nope! You should probably get your hands on a copy of the book Prints immediately. It’s awesome. Included with the book is a disc of some of Heather’s artwork. 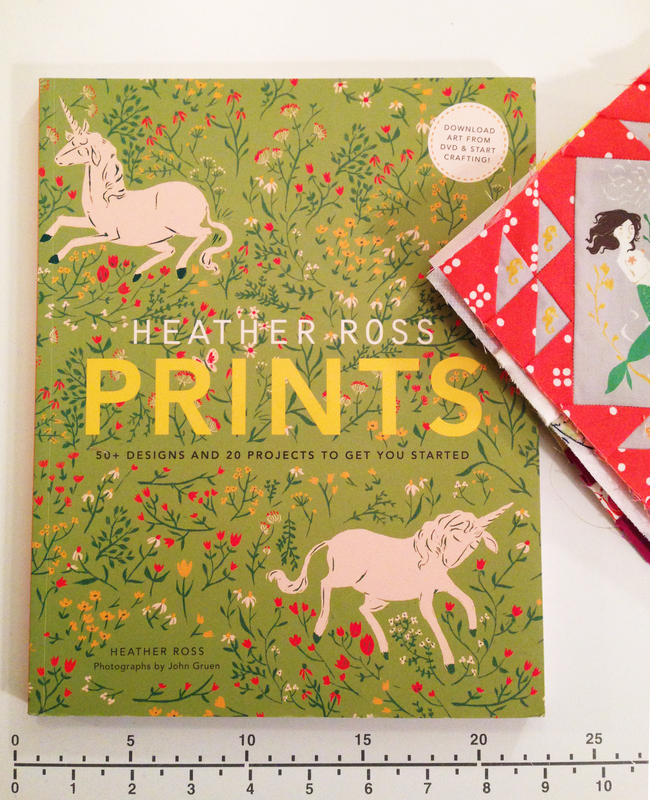 The whole book is about using technology to design and change fabric, and she offers her prints as a starting point. 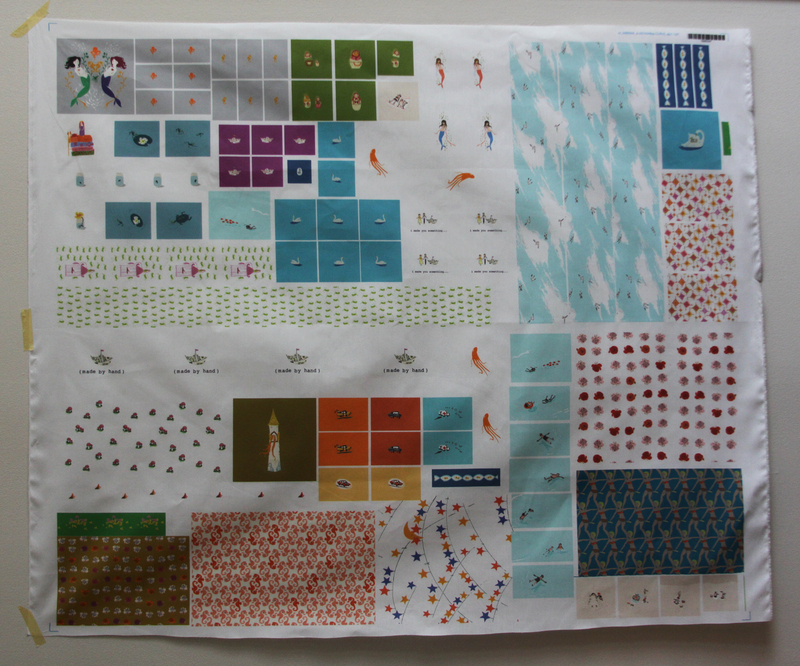 In other words, you can customize the prints however you’d like and print them on Spoonflower! I started with the Mermaids print from the Mendocino line, making one a redhead and the other a brunette. Admittedly, she has TONS more experience with colorways than I do. I’m not sure that mine was an improvement. But it was incredibly fun to play with the prints in Photoshop. Perhaps my favorite thing about having the prints in electronic format was being able to increase or decrease the size of some so they would fit on the blocks in the Farmer’s Wife book. Each block is only 6″ finished, so many of the prints would have been too big without resizing. And where I had to choose to sacrifice either the print or the block design, I’ve decided in most cases to favor the print. You can see an example of this in one of the other blocks I completed (described below), Block 79. This block was originally just a 9-patch block. After holding the elephant up to lots of different blocks featured in the book, I realized it wouldn’t fit on ANY of the blocks. 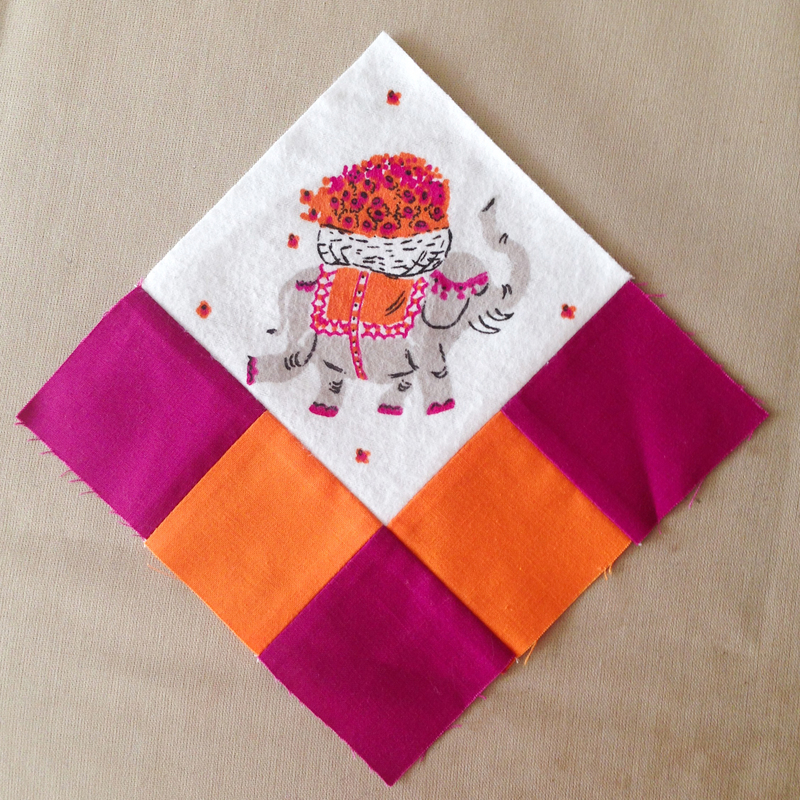 I made the executive decision to combine several of the pieces to feature the elephant on a block. I am thrilled with the result. I basically started with all the largest-scale prints and then looked for a block that had pieces large enough to accommodate them. This block not only fit the mountain top, but placed it at the top of the block like the skiers were skiing down from the top of the mountain. I made the lower left skier look like he’s falling on accident, but otherwise, I love the effect. 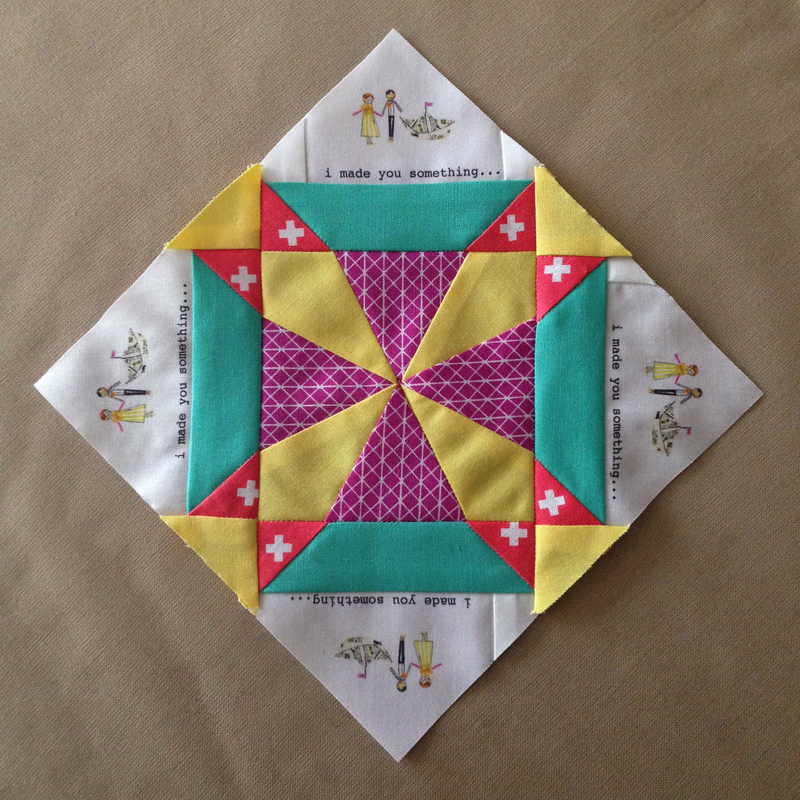 The center block actually came from a charm pack of Gardenvale fabric that I got as a freebie at QuiltCon. Pretty sweet, right?! I like how it included the snail colors but added a few more to the palette. Without the center piece, this block would have had almost identical colors to Block 79. I like how a single fortuitous print opened the door to so many options! This incorporates another image from the book Prints. The image was actually intended for gift tags, but I thought it would be cute for a quilt, which of course is another handmade item. 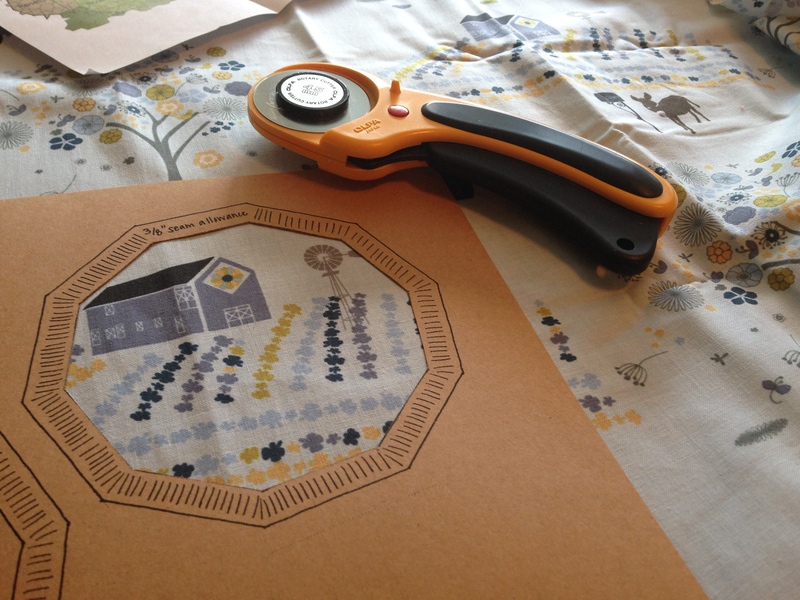 Sadly, when I cut apart my Spoonflower fabric, I accidentally cut these pieces too small. 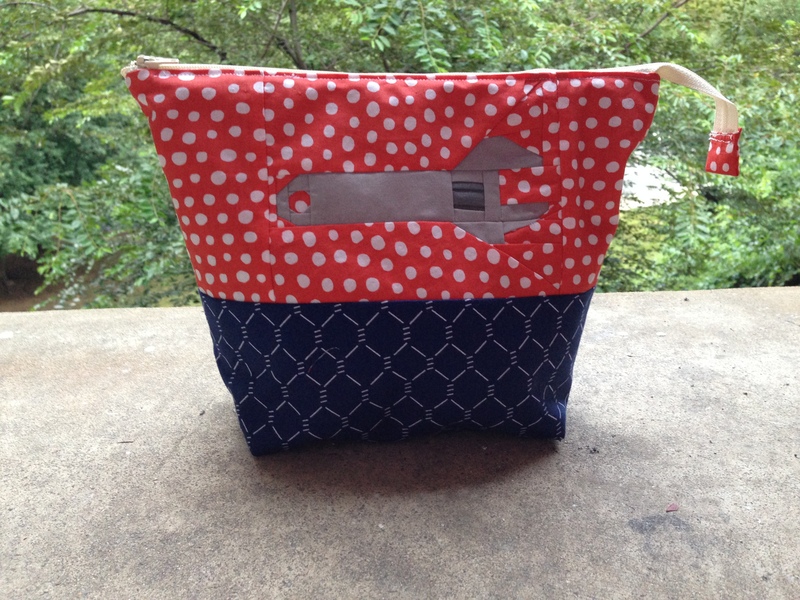 I was glad I thought to save the scraps, and the scrappy look that resulted isn’t something I mind at all! Watch for these images in future blocks! Thanks for visiting, whether you’re a longtime follower of my blog or visiting for the first time as part of the Blog Hop! A little over a year ago, I got married. It was an awesome wedding. We were surrounded by friends and family. Family members included a new sister-in-law, who offered to cook for the entire guest list. And then the refrigerator of the industrial kitchen we were renting died the night before the wedding, so she cooked the entire meal again the day of the wedding!!! Perhaps the sweetest part of all is that no one told me until the wedding was over so I wouldn’t have to worry. Yep, I have the best friends and family ever. We talked late that night about the cool air, how quilts are great for snuggling against the chill. We bonded over our preference for really thick quilts. (Even though they’re a bear to sew and I understand why others avoid making them now that I sew myself.) I told her I would make her a quilt. It might take me 40 years, I said, but I would make her a quilt. Just before our first wedding anniversary in September, I finished her quilt! I’ve always been an over-achiever, but 39 years ahead of schedule is a new personal best! By contrast, the photo might be a personal worst. This beast is king-sized. It has both wool and cotton batting. It weighs nearly 20 pounds! 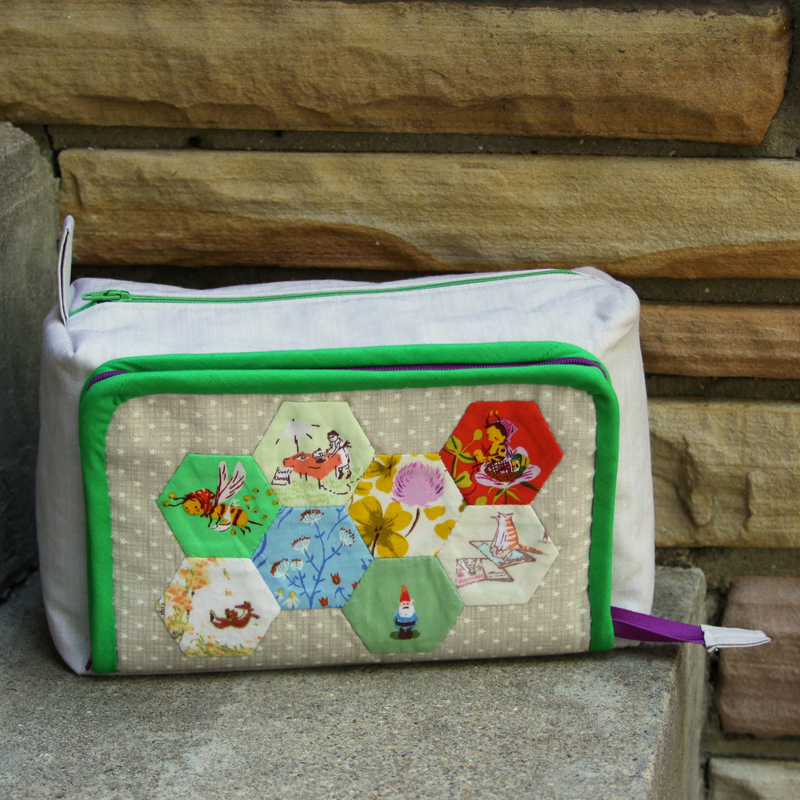 The day this photo was taken, I was furiously sewing on the binding (see the Clover clips to the right and bottom?). My husband and his brother were about to drive from Chicago to Colorado Springs to visit their sister, and I wanted them to be able to present it to her in person. I sewed right up until the last second and barely had time to throw it in their car before they left. I didn’t really have time to stage a photo. I took this unfinished photo while the light was still okay, realizing I’d already missed the best window and that it would be even worse when I finished the quilt. I was working from the shop of their family business, so I threw it over the lofted area and held it there with some paint cans. (It is possible one fell, broke open, and left a tiny paint mark on the almost-finished quilt, which I noticed as I put in the very last stitch. Doh!) The purpose of this narrative is not so much to apologize for the photo as to point out it perfectly captures what sewing this quilt was like! One final note: the quilting bar on my Janome machine made quilting the cross-hatch SO MUCH EASIER than it would have been on my Singer! The dual feed meant my top layer didn’t get “pinched” or pucker repeatedly. I thought for years that I was just infinitely less talented than every other quilter; I learned the tools make a huge difference. 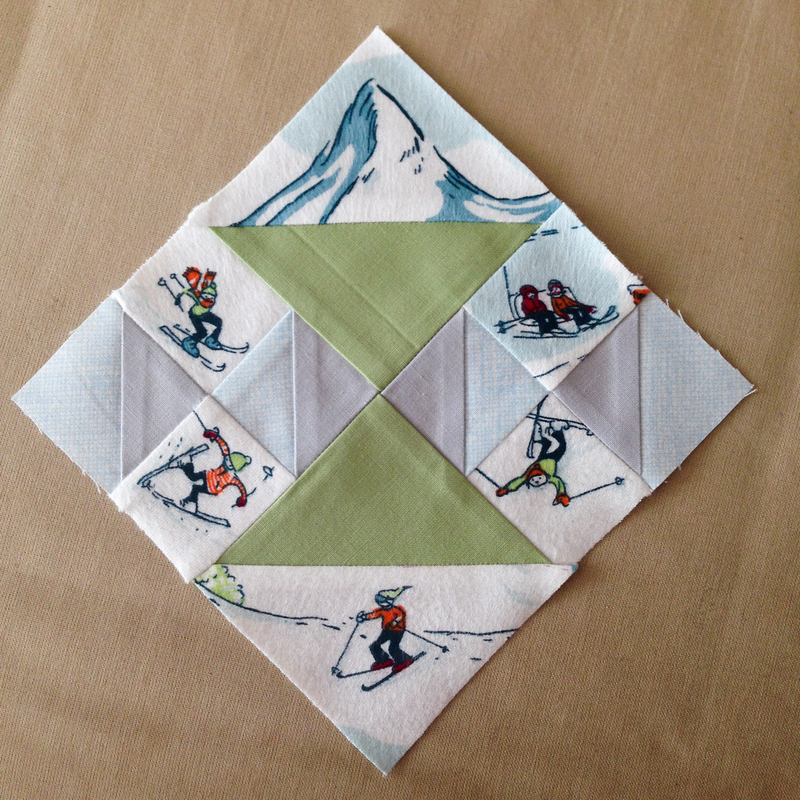 I even tried some free motion quilting (FMQ) along the edges. Although the plus shape is comprised entirely of straight lines, turning the quilt at every corner and jamming it through the throat space was a nightmare. Using FMQ instead was *slightly* better. I still have lots of practice ahead of me! 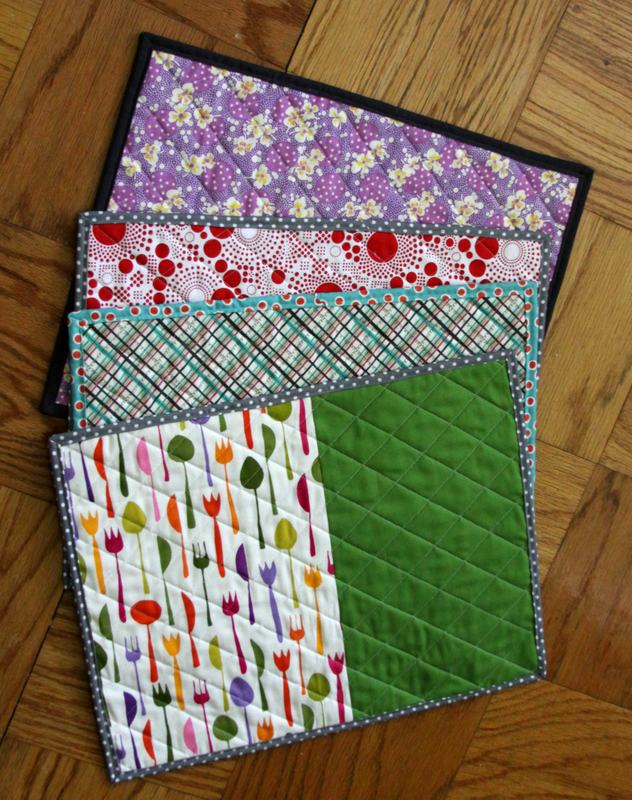 I don’t buy many quilting books because I’d rather make my own projects most of the time. 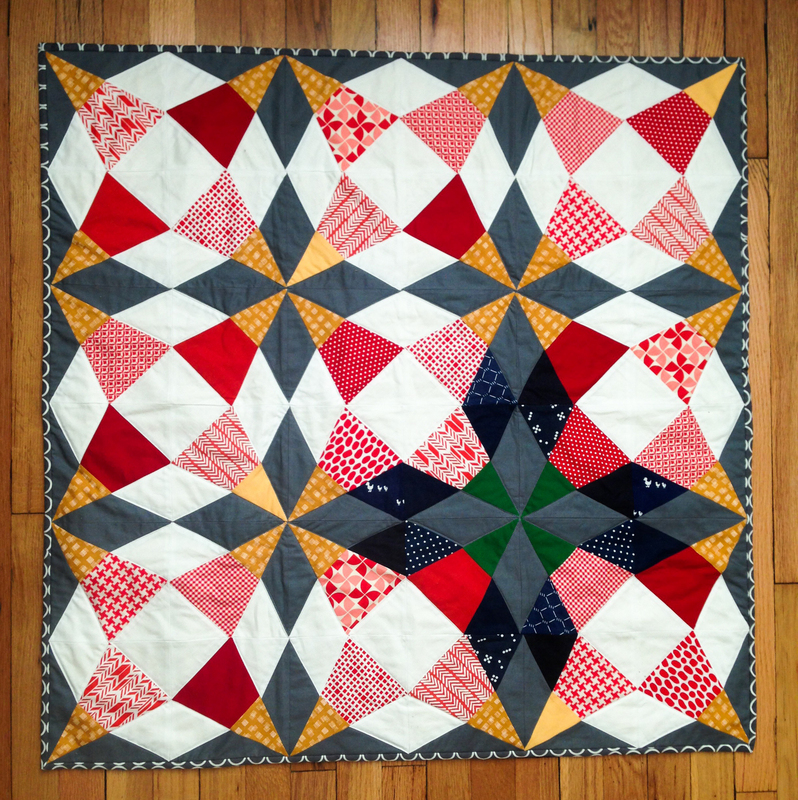 Vintage Quilt Revival was an exception. Almost as soon as I bought the book, I learned that Katie Blakesley was a member of the DCMQG at the time and that she’d be hosting a trunk show. When I saw her Cut Glass quilt, I fell in love. It might be too strong to say I was hoarding the pattern, but I definitely had it in my pattern library and was waiting for an opportunity to use it! When two of my best law school friends announced they were having a baby, I knew I’d found the perfect match. I made it baby-quilt-size instead of a regular-sized quilt because other new parents have told me they like having a mobile blanket. It can cover a stroller or car seat, protect a baby when lying in a germy public space, and becomes a “blankie” when the baby outgrows these uses. 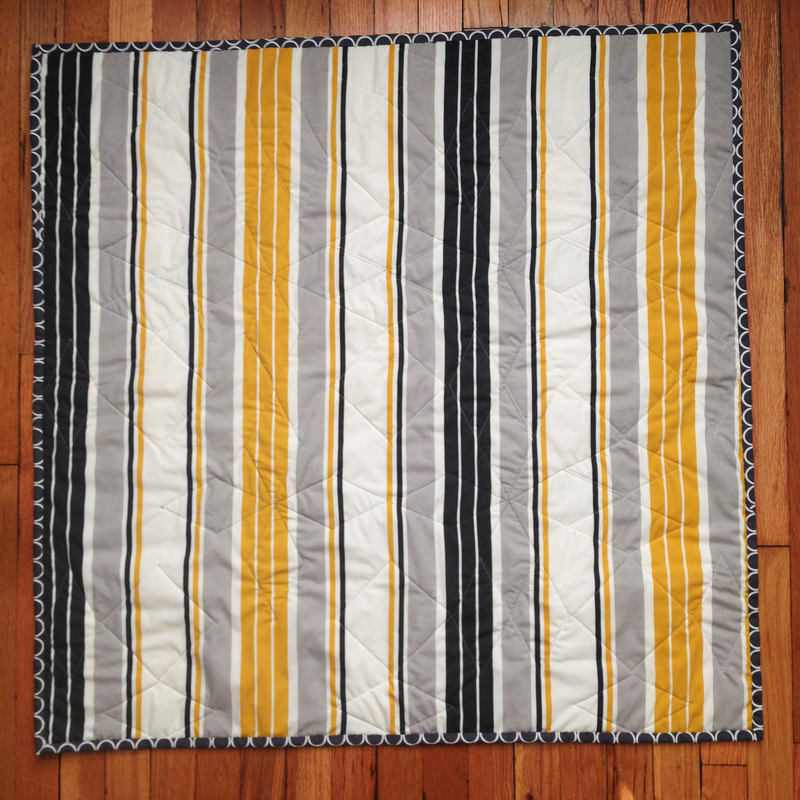 Not only does the back side of the quilt match the gray and yellow nursery décor, but it is also reminiscent of the Steelers’ colors – baby’s dad is a huge fan! 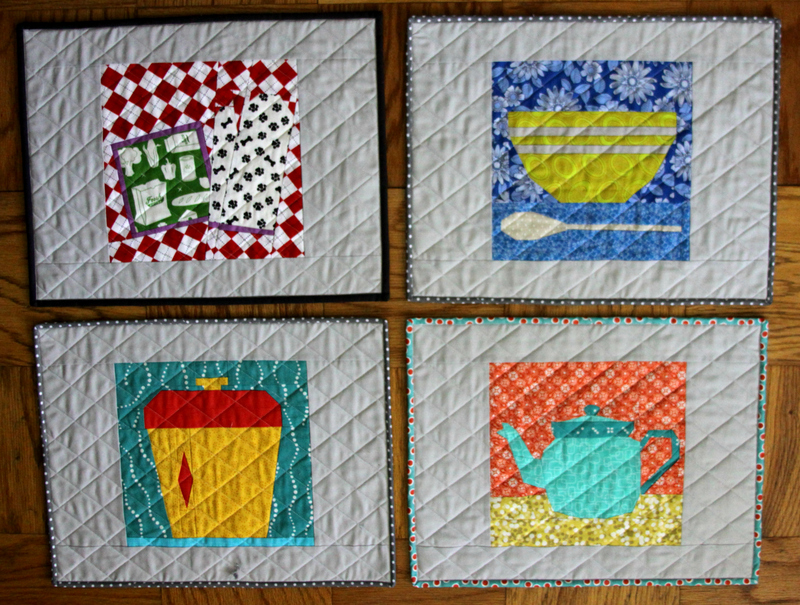 I rescued the project and am able to check one UFO off my list by turning the finished blocks into placemats instead. The kitchen theme works perfectly in the kitchen! As an added bonus, the blocks match an oven mitt and some potholders I made my sister for Christmas a few years back. Glad to have one more project off my list. And my cutting mat. 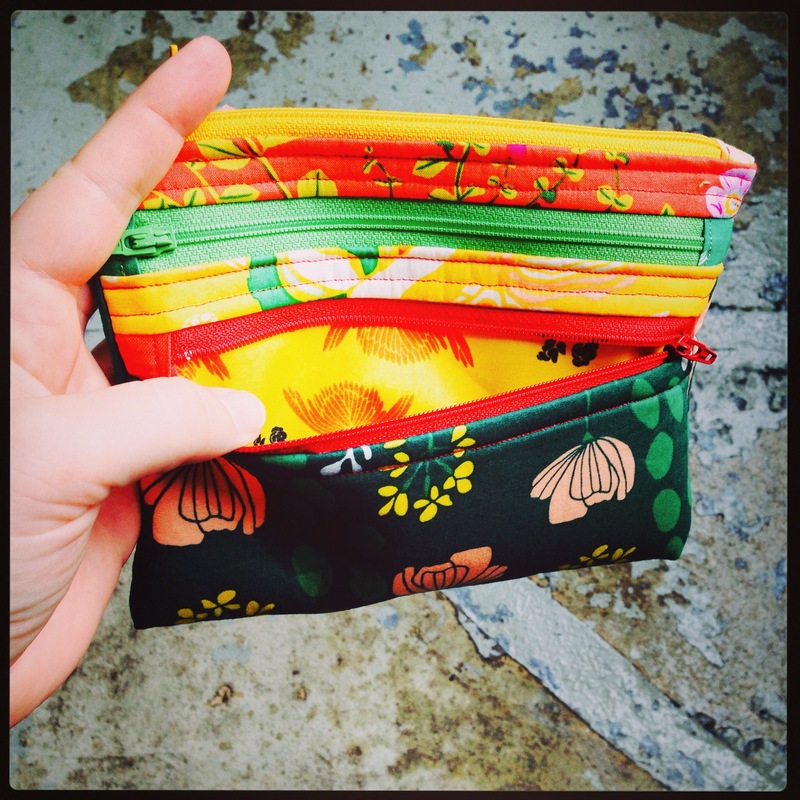 August marked the last month of my #birthdayclubhandmade swap… although I’m only posting about it now! I learned a lot from hosting my first swap, and I got to know some quilters a little better since most of my “sewcializing” is done online. August’s birthday girl listed as inspiration mom and daughter duo Bonnie & Camille. 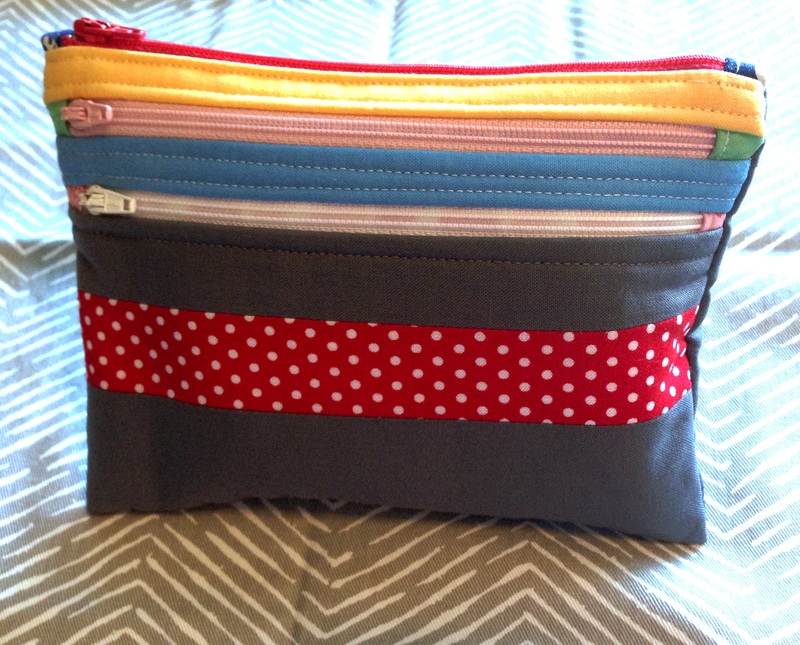 I present the Bonnie & Camille-inspired triple-zip pouch! 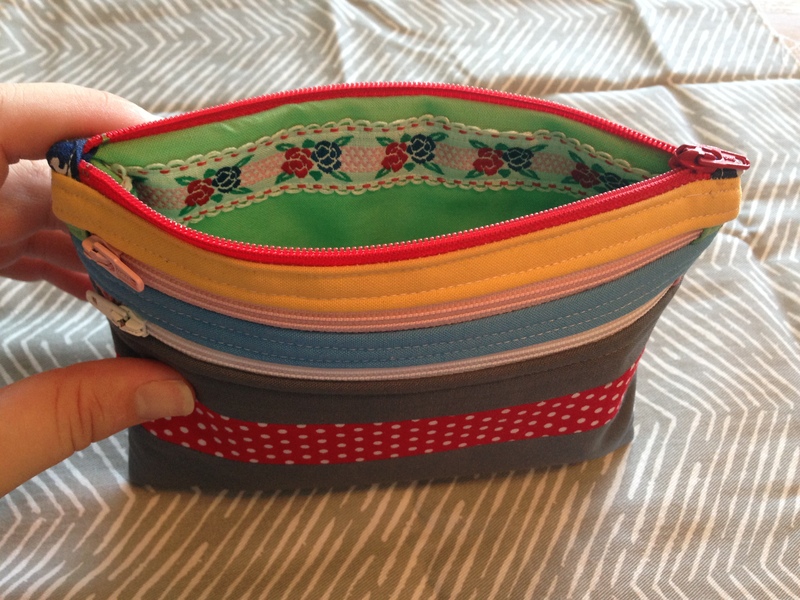 I found that, although I like Bonnie & Camille fabrics, I didn’t have many in my stash. However, I had lots of fabrics that were in more or less the right colorway. 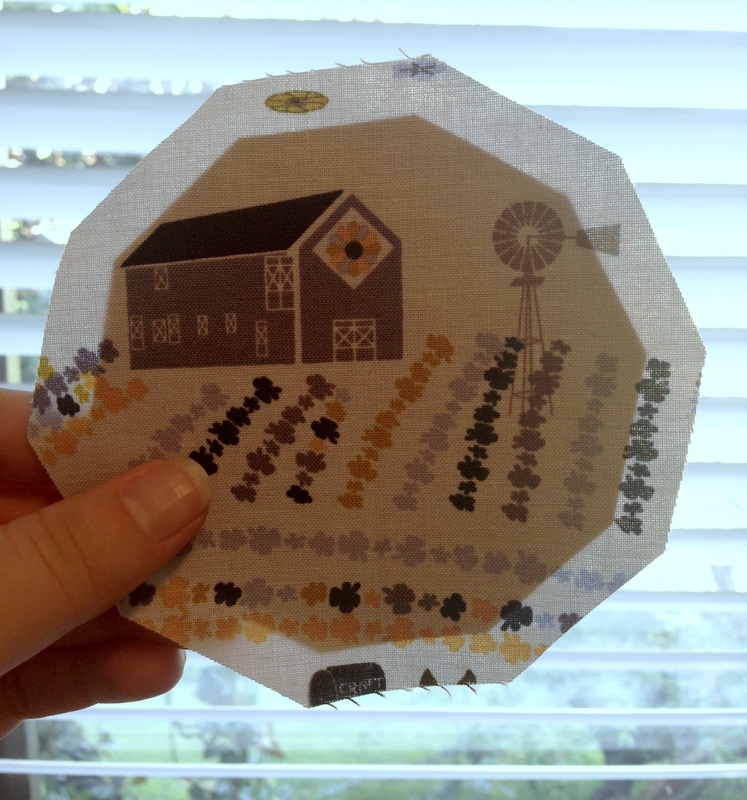 I also had a Thimble Blossoms pattern: the mini swoon. The mini swoon finishes at 8″. 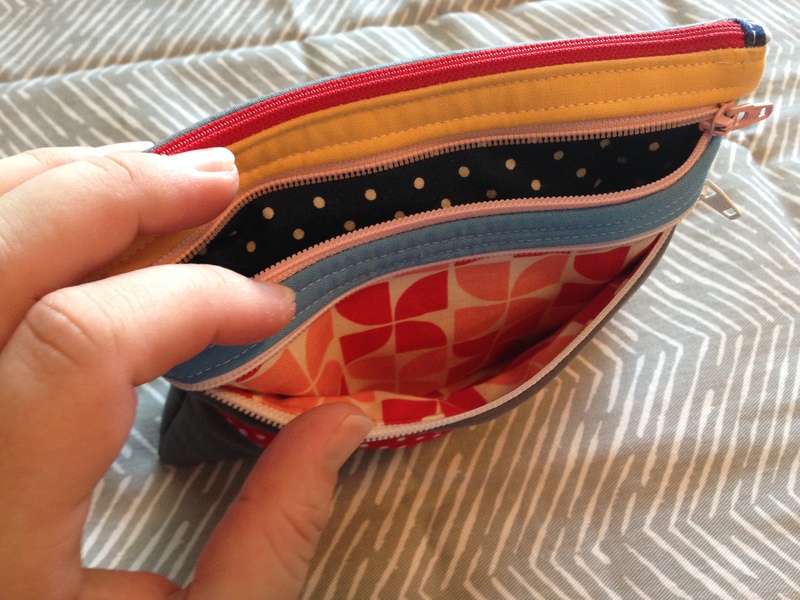 To fit the back of the pouch, I reduced by half. The swoon above is just 4″! Some of those HSTs are 1/2″. 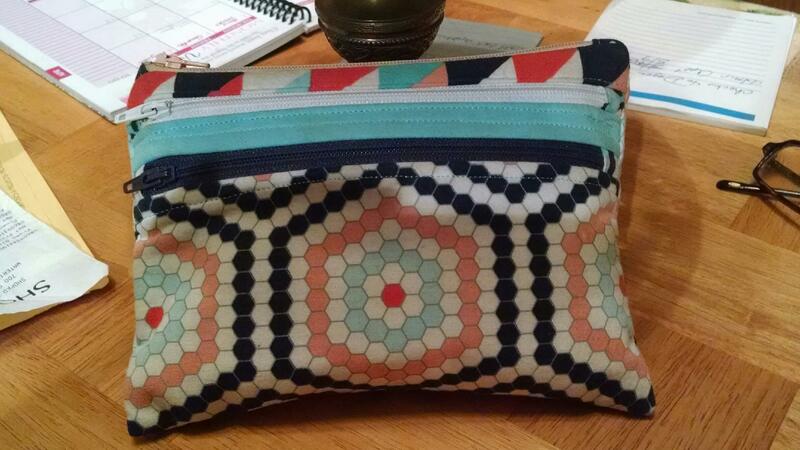 Who knew something so small could take so long to sew?! I know the number of pieces is more important than size in determining sewing time, at least in theory. I always forget when I decide to sew something small, haha. 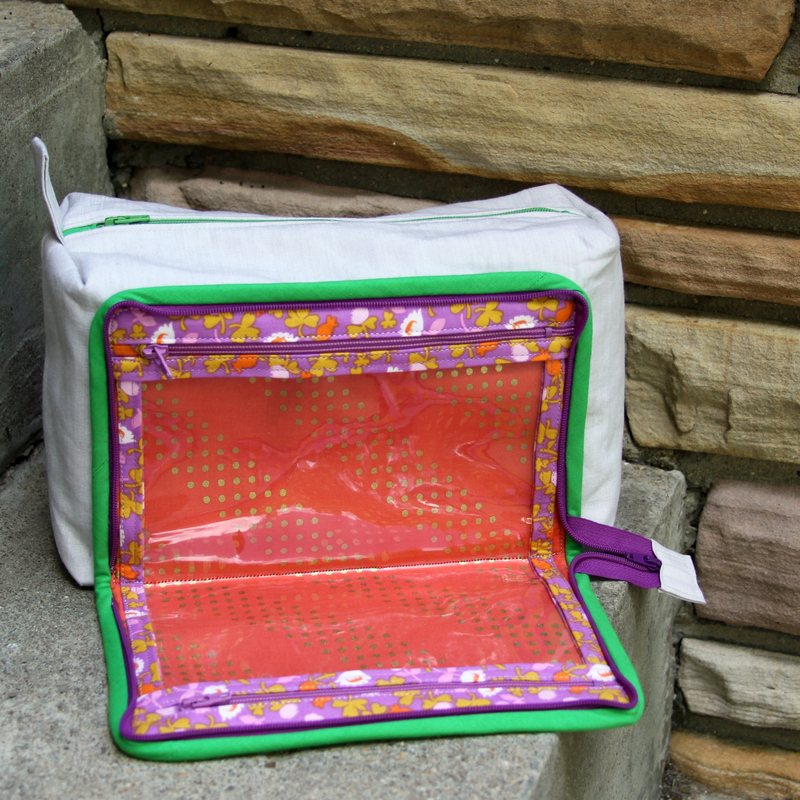 Each of the interior pockets is a different color, too. I stitched a piece of vintage ribbon into the biggest pocket. It matched perfectly! 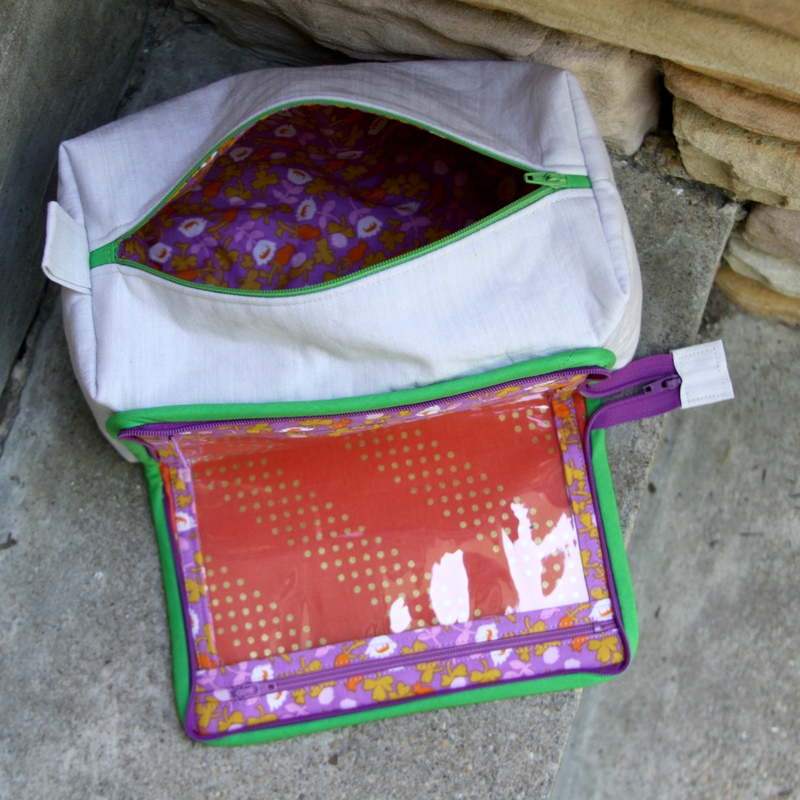 The triple-zip pouch is a pattern I have used before on several occasions. I love it! On one hand, I’m sad the birthday swap is over. It was fun watching my Instagram feed to see what others in the group had made. 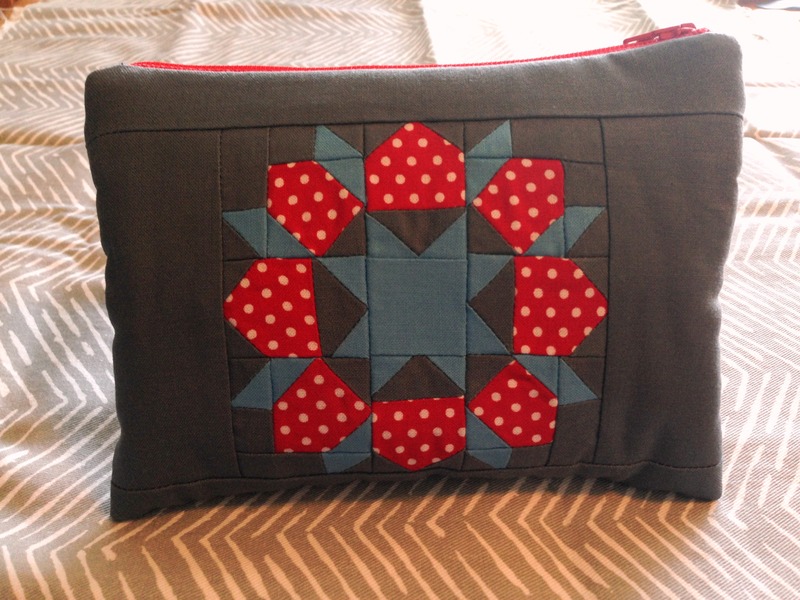 On the other, I can’t wait for all of my sewing time to be spent on “me projects” for awhile! I also have a bunch of big life changes on the horizon, so fewer commitments will be a good thing. Thanks to everyone who participated or followed along! Categories: Other Sewing | Tags: bag, birthday, birthday club, birthday club handmade, birthday swap, birthdayclubhandmade, bonnie, bonnie & camille, bonnie and camille, camille roskelley, mini swoon, ribbon, sew, sewing, swap, swoon, thimble blossoms, three zipper pouch, triple zip pouch, vintage, vintage ribbon, zipper, zipper pouch, zippered pouch | Permalink. At a rate of about one rosette every two months, I’ve finally finished my second! With saturated red-oranges, prints resembling snowflakes (at least if you squint), and wintery novelty prints (polar bears and Heather Ross/munki munki ice skaters), I call this my “fire and ice” rosette. 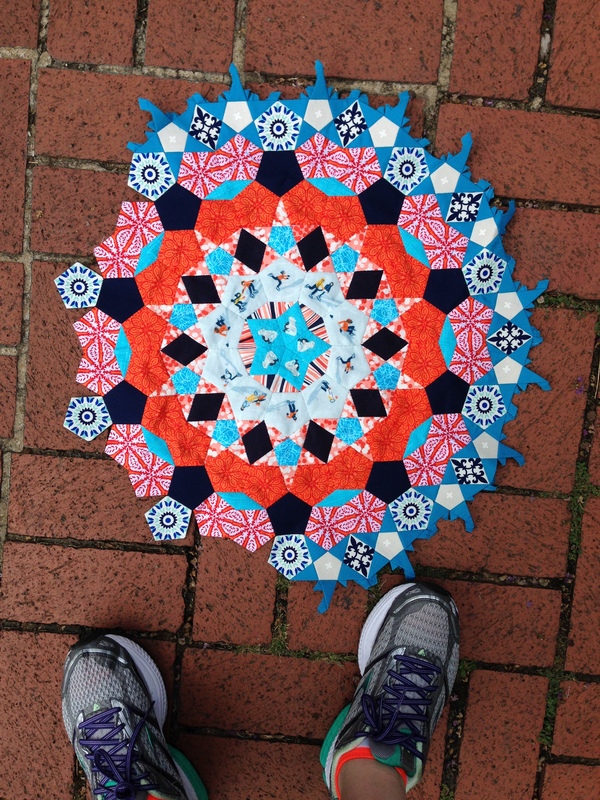 I mentioned in earlier posts (here and here) that I plan to make my entire quilt in blues and oranges. I know I also said this before, but the rosettes are HUGE! I took a photo with my feet for perspective. Here’s a progress shot to show how I work. I got the hour basket as a swap gift for my birthday (#birthdayclubhandmade) and keep pretty much everything I need inside it so I can take it with me to the coffee shop on weekends. Probably my rosettes would go a lot faster if I worked only on one at a time from start to finish. Instead, I usually finish the center of one, start basting (hand sewing), get bored, and sew another center or two in the meantime. I am currently started on three other rosettes. First, I made a template of the rosette center. I think this is no major feat since anyone can line up a few diamond shapes, and it’s pretty obvious how they fit together if you’ve seen a photo of even a single rosette. 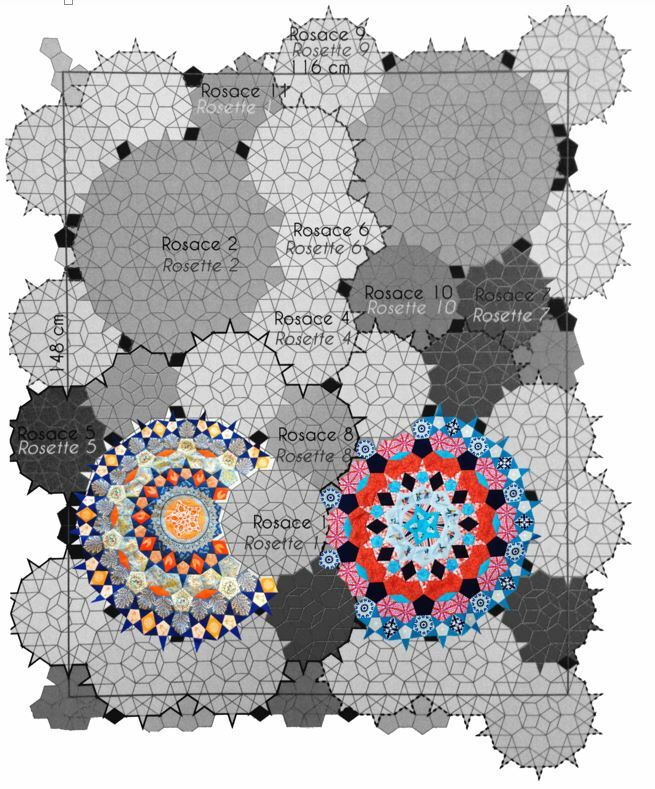 The trick to La Passacaglia is how all the rosettes fit together. Definitely get the book if you want to make the quilt! After printing a template, I cut out the center of one of the images. I lined up my fabric underneath the cut template. You could start basting your fabric to the center template at this point, but I wanted to glue mine in place for precision. Place your fabric wrong side up. 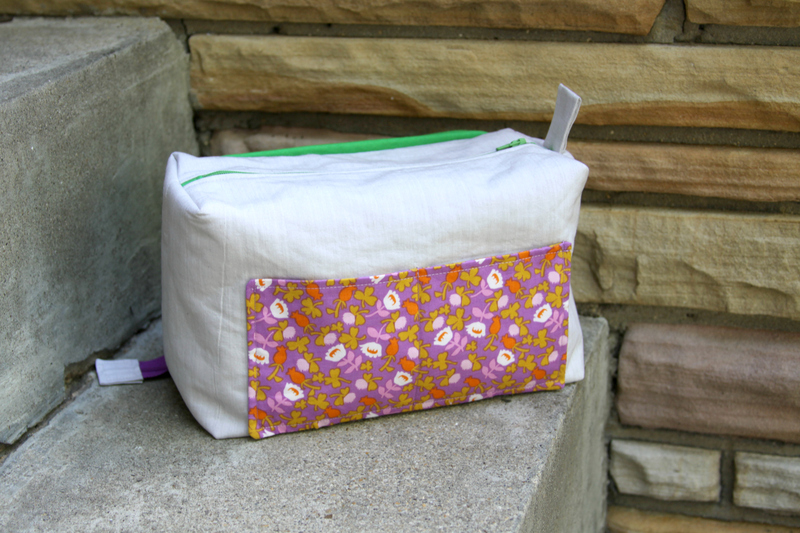 Line up the seam allowance piece around the outer edges of your fabric. Place the center piece (with diamonds meeting in the middle) wrong side up. 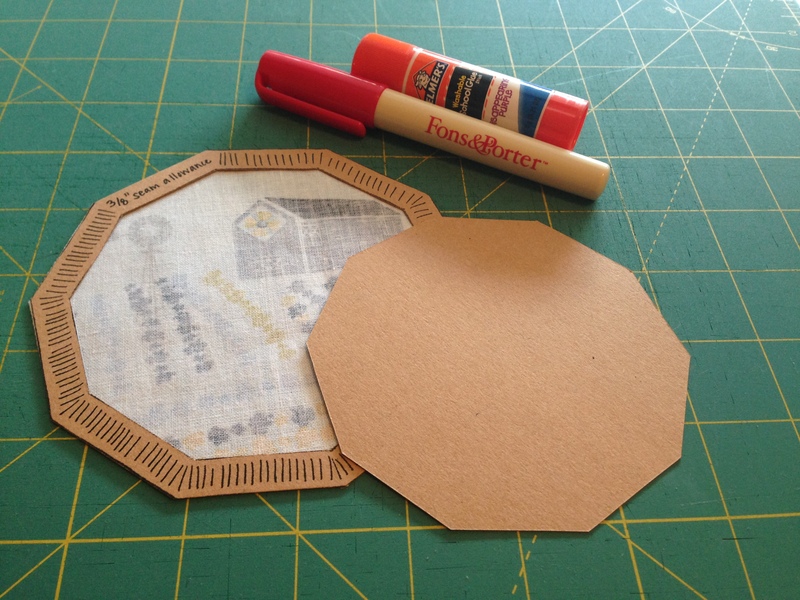 Glue the back of the center piece using either a fabric glue pen or a washable glue stick. Glue the center piece to the fabric (obviously glue side down), lining it up with the seam allowance piece. Then remove the seam allowance template and press. Note on laser printers: Since laser printers use heat to bond ink to paper, running your iron over laser ink is like getting paper wet when it’s been written on with washable marker: the ink will smear. 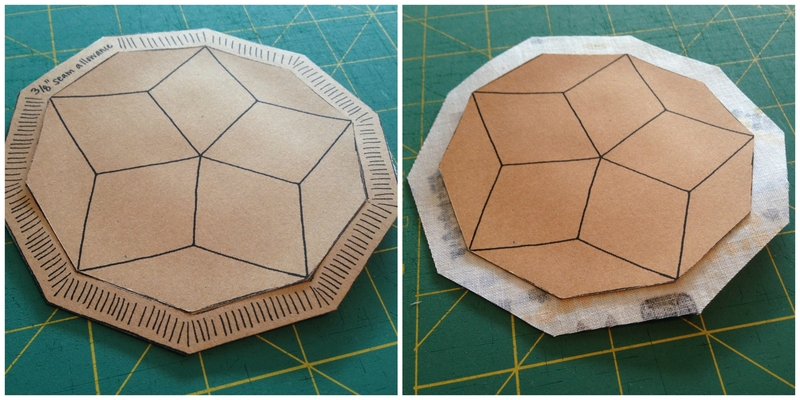 If you’re using a laser printer, I suggest placing a piece of scrap fabric over the template before pressing. Also, it’s best to press without steam since the humidity from steam will curl your paper. One final note: I traced around each piece separately when making my template so I could use it as a single piece or remove any portion (e.g. removing one diamond to use a different fabric). However, it is much easier to baste convex corners (corners pointing outward) than concave corners (corners pointing inward), so keep that in mind if you remove a portion of the center template. 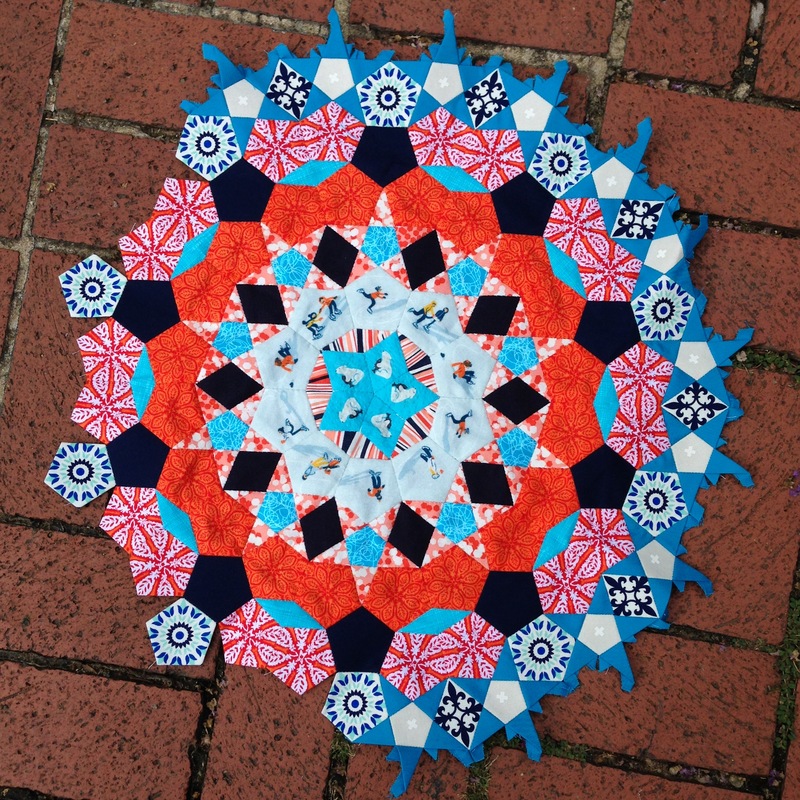 Categories: Quilts | Tags: baste, basting, blue and orange passacaglia, cog, edqpassacaglia, english paper piecing, epp, free passacaglia pattern, free passacaglia template, glue basting, glue pen, glue stick, gluestick, hand basting, la passacaglia, lapassacaglia, millefiori, millefiori quilts, orange and blue passacaglia, passacaglia, passacaglia center, passacaglia cog, passacaglia pattern, passacaglia rosette, passacaglia template, quilt, quilting, rosette, sew, sewing, willyne hammerstein | Permalink.